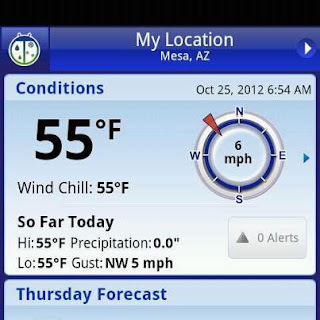 I really thought that Fall had arrived in the Valley of the Sun when the temp during my walk yesterday morning was in the low 50's. Even BJ was celebrating the arrival of Fall on her Facebook page. Unfortunately, the overnight lows for the next week are all forecast to be over 60 degrees. It has been cool enough to make hiking enjoyable. The gals invited me to go with them a couple weeks ago on a hike to Wind Cave at Usery Park. It's a 3.2 mile round trip with 800 feet elevation gain that leads through the desert to beautiful view of the valley. It's impossible to get lost on this hike with directions to Phoenix in view throughout the hike. Apparently the pilots that trained here during World War II had a bad habit of getting lost. In addition to the trails, the approximately 6 square mile park includes over 70 sites in the camping area with water, electric, and a dump station for $25 per night. Nearly empty during the summer, it will be filling up now that temps are more reasonable. Dry camping is available about 7 miles away in the Tonto National Forest for $6 per night with 50% off for seniors. 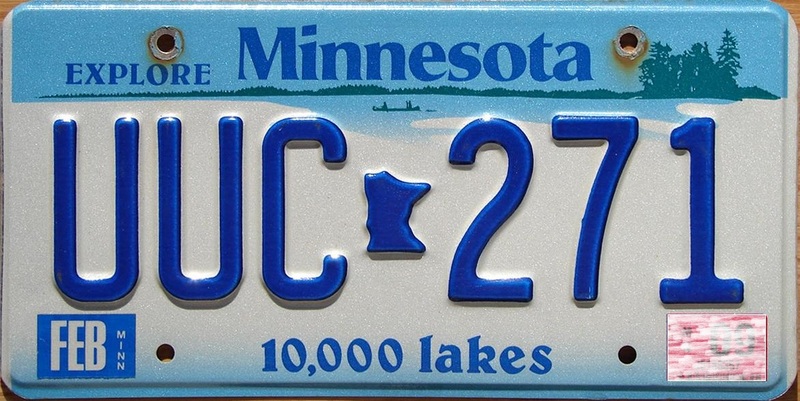 The confirmation that seasons are changing is the number of out-of-state license plates that are showing up on the street. Michigan, Minnesota, South Dakota, Washington, and Oregon are all showing up in significant numbers. I guess it's time to get out and enjoy our local back country. I had every intention of making progress this weekend on a window awning project for the Scamp. I was going to shamelessly steal design concepts from a gal (Borderbrae) on the Casita forum, and had all the necessary "stuff" collected. Then BJ posted this picture on her Facebook account on Friday and I knew my weekend was going to go a different direction. The seep in the drip system turned into a leak, and the leak turned into a good reason to replace the main feed with PVC instead of the 10 year old flex line the builder had installed. 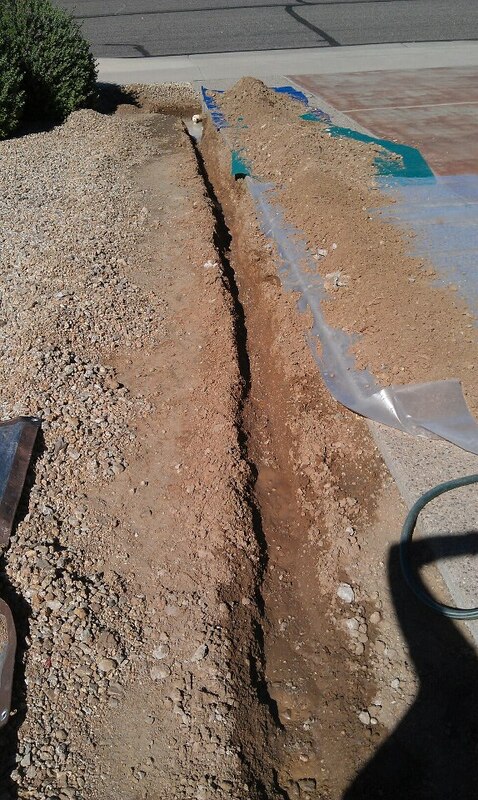 It sure was nice that she got a good headstart on the trenching. 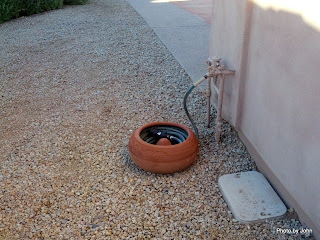 It's also nice to live in Phoenix where we don't have to worry about weatherizing - at least not in the same way some of our friends and family do! No need to bury the drip system below the frost line around here. New control valve to replace the cracked one, new pressure reducer, and new line. Should be good for another 10 years. 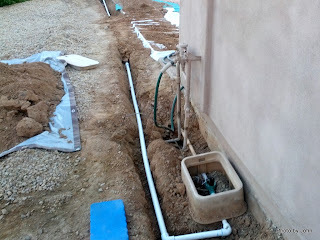 All done and you can't even tell there was excavating going on. As long as the glue and pipe cutter were out, I did get supports for the two side dinette windows made, but the awning project is going on hold for a bit while my seamstress partner gets the bits and pieces ready for her annual "Gals making Christmas cards" week. We'll pick up on the awning after the Christmas cards are done. It's State Fair time in Arizona. We went on the first weekend and were disappointed in the animals. A bunch of goats and rabbits and a few beef, but no dairy or sheep and only one pen of small pigs. Perhaps those will be later since the fair runs for a couple weeks. The carnival portion of the fair seems to get bigger every year, and the rides get less and less interesting! The big reason to attend the fair the first weekend was to get a dose of culture at the figure 8 races. These are lots more interesting than a demolition derby because there's some speed and daring to go with the mud, mayhem, and trashed cars! I'm back to (aka "still") dreaming. The Alaska trip next summer is still a long ways off, but that's no reason to be ignoring it. By temperament and training, I'm a planner. 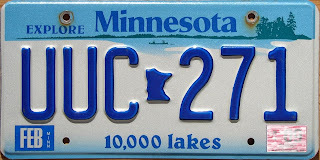 Unlike the plethora of information about the Boundary Waters Canoe Area in Minnesota, there seems to be very little written information about flat water canoe routes in Alaska. I noticed a mention of the Swan Lake Canoe Trail when reading the Traveler's Guide to Alaskan Camping by Mike and Terri Church in mid-August. Attempts at research on the Swan Lake system didn't turn up much online, but did lead to the discovery of Daniel Quick's guide. The nearly twenty year old book makes the Swan Lake route the most documented route in Alaska. 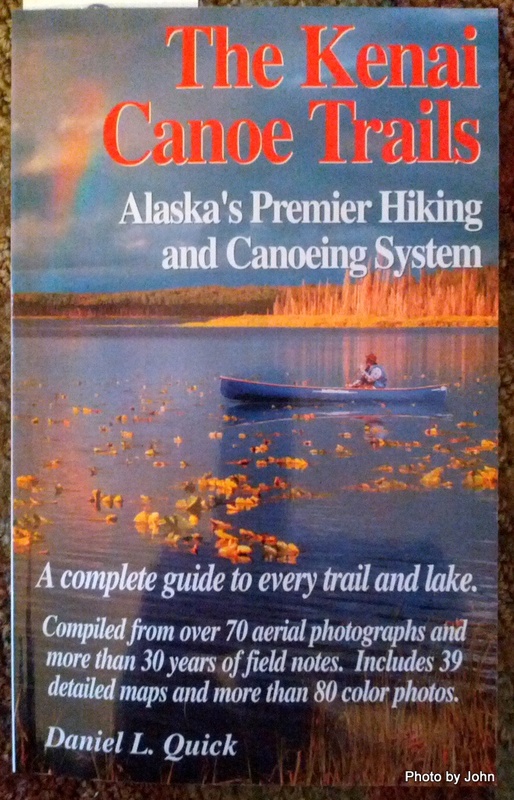 I ordered a copy from him and have really enjoyed considering a couple options for a possible multi-day canoe trip while in Alaska next summer. In addition to the Kenai options, I've seen a little information about the Lynx Lake circuit in the Nancy Lake State Recreation Area near Wasilla. In addition to a possible "grandparents" trip, I'm hoping I'll find something that looks logical for a first overnight canoe trip with the grandson and this might be it. I know there are other canoe routes in Alaska but most are much more remote, include whitewater, and are much less documented. Feedback from anyone with experience on Alaskan multi-day canoe routes would be appreciated! 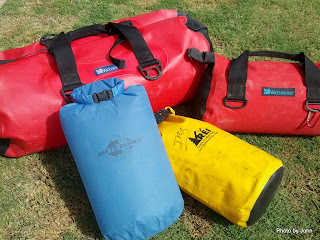 I've had several friends inquire about how we kept stuff dry on the Green River trip. Packing gear for a canoe trip is somewhat influenced by regional experience. For example, many canoeists in the Boundary Waters Canoe Area default to a device that looks like a canvas pillowcase with shoulder straps and a flap forming a lid, commonly known as a Duluth Pack -- or one of its modernized relatives. Keeps things together and easy to portage, but it's not waterproof. With some western whitewater and kayak exposure, we've long used roll-top dry bags in various sizes and materials. The yellow bag is now at least 10 years old. While it's branded REI, I suspect it was made by SealLine who have long made a line of urethane coated nylon dry bags. They can be stiff in cold weather, and don't stuff in the kayaks as nicely as lighter weight dry bags but they are super tough and as such, some of them get invited on every trip. The blue bag by Sea to Summit is one of many that we've added to the collection. They aren't as tough as the heavy urethane coated bags, but slide into the boat and past other dry bags nicely. Empty, they nearly disappear. Sea to Summit also makes wonderful compression dry bags which are great for squeezing sleeping bags. 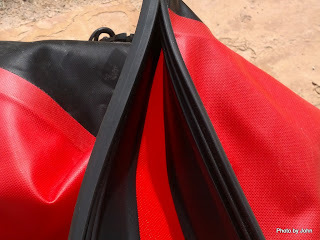 For the canoe, as long as there are no portages expected, the red Watershed bags are my first choice. They're too big for kayak hatches, but they are very tough and absolutely waterproof. Certainly not the least expensive option, but you only need to buy them once. 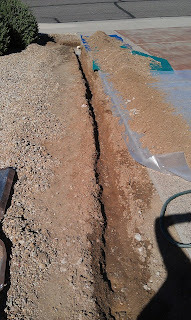 They use an overgrown "zip lock" style seal that is then folded under and clipped in place. 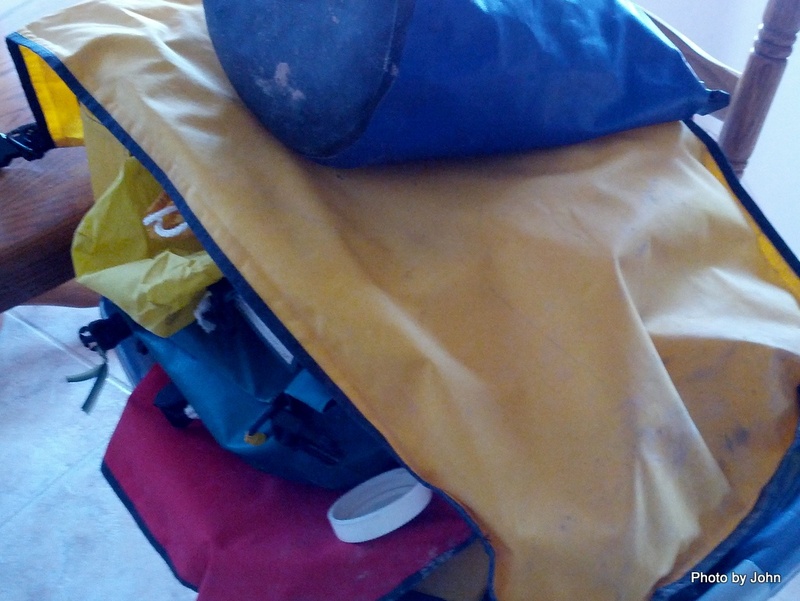 The small one is my "day bag" and goes along almost every time the canoe is on the water. The larger one is large enough to handle all my personal gear, clothes, sleeping bag, air mattress, etc. We have a second one generally used by whoever paddles bow. If the trip involved portages, I default to an NRS "Bill's Bag" which is a 110 liter roll-top dry bag with shoulder straps. The sit-on-top kayaks with a tank well for a SCUBA tank in the back can leverage a larger waterproof container. The large Watershed bag or the Bill's Bag are options, but blue barrels are another packing system popular with some canoeists. While I've never used the two barrels I picked up on e-bay in the canoe, the approximately 40 liter barrels fits nicely in the sit-on-top tank well. Often used for shipping olives, the ones I got had been used for shipping pharmaceutics. The forward hatches can handle medium sized dry bags like this vinyl coated nylon roll-top bag. We haven't figured out how to get the gear to clean itself. 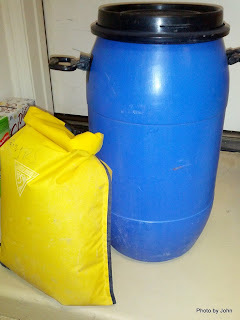 The laundry basket is full of dry bags and gear that is destined for the back lawn with a bucket of soapy water and a scrub brush. Seems like there's no way to get home with clean gear ready to be stored until the next trip. Maybe that's why I like the Scamp trips - seems easier to get it prepped for the next trip. 90 days until we can start using the Scamp more!